Office floors are not just ordinary floors. They showcase the class of an office. They have the potential to turn up the souls and make the environment awesome. Regular maintenance of an office floor is as crucial as bathing. Just to clarify, you must bath daily to keep healthy and active (THAT’S NOT NEW!!!). Just like that, you need to make sure that the environment of your office also remains healthy and productive. Cleaning a floor is one thing and after that maintaining is another. For cleaning, many corporate companies usually opt for some sort of corporate cleaning services and that is a good thing. They are experts in that so you can let them handle the matter. However, when the floor maintenance is concerned, you need to know how you can keep your floor clean and safe. The psyche of colour and composition does play a very important role here. You don’t want to make your employees feel negative and gloomy all day. Cleaning and maintaining your office floor will also protect your floor from unnecessary damages. Let’s have a look at how you can work it out and make your office a happy place to work in. When your manufacturer crafts the floor of your office, they recommend the cleaning in a specific manner as per the material used in the flooring. You need to make sure that practice mustn’t lose consistency. Cleaning the floor is one thing and cleaning the floor in a wrong way is way too worse than leaving it unclean. 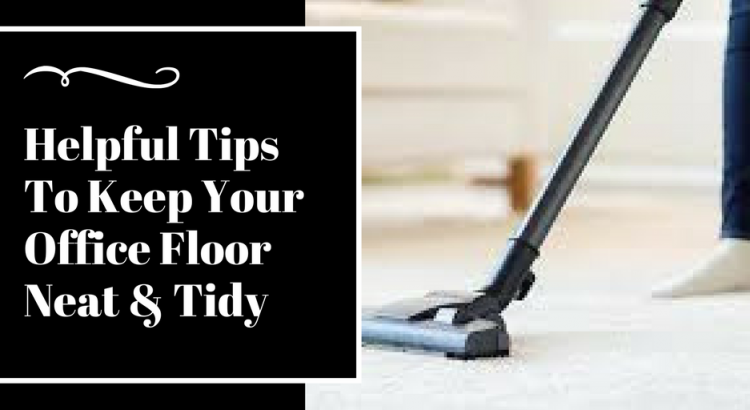 So, make sure that you have the clear understanding of how to clean your floor and what methods of cleaning are being used. Using mild chemicals is the best way of cleaning the floors as the highly volatile chemicals might damage your flooring. Do You Use Floor Protection? Every manufacturer recommends the maintenance of the floor. For hard floors using the floor, protection is the best way of keeping the floor safe and sound. Heavy duty mats in the entry area of your office will make sure that your floor is safe in the foot falling areas where the probability of damage is very high. Replacing mats are easier and cheaper than changing the entire floor. So, follow the recommendations and keep your floor safe from the damages. How To Remove Stains From The Floor? There are many types of damages that can discolour your entire floor. The straightforward solution to this problem is to clean the stains and spills as soon as they got there. If you have a big office, then you must have a janitorial service without which cleaning up the stains is very difficult. If you don’t have a janitorial staff then you might need to consider in hiring one as soon as possible to avoid any long-term damages to your office floor. In order to keep your workplace organised, you must make sure that the floor is regularly cleaned up. Again, having a janitorial staff will help you in maintaining the floor decorum of your office. Schedule them to clean the floor at least thrice a day if space is not too big. For big office spaces, you might want to keep the track of area mostly used such as pantry area and the washroom area must be regularly cleaned. So, keep a track that your floor in every inch of your office gets cleaned up on regular basis. Cleanliness is a bliss. You don’t want your office to look like a playground (playground in productivity is good, but not literally!!!). Follow these tips and make sure that your office floor is well cleaned and maintained on regular basis. You can also take help from professionals if you like. In short, the call is yours. It is your office and if you crave for positivity and productivity, you might want to keep the ground clean and tidy. Ciao for now!!! Olivia Anderson is the blogger by profession with 5 years of experience. She is associated with a Woodcroft Enterprises, best Commercial Cleaning Service Melbourne in Australia. She works closely with B2B and B2C companies providing useful and engaging content that converts viewers into customers.